Inexpensive Peterson Scavenge Filters removes debris from the oil before damage to your expensive oil pump occurs! 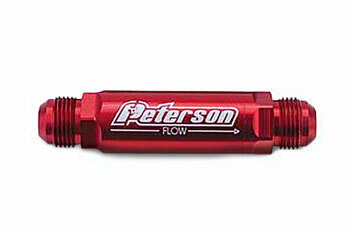 Petersons Scavenge line of Aluminum billet inline scavenge filters are compact and provide a great way of removing harmful parts from the oil before they reach the pump. Free flowing, sizes of -10, -12, & -16 are available and have twice the filter area of our installed Dry Sump Pan Screens and are highly recommended as a secondary filter.